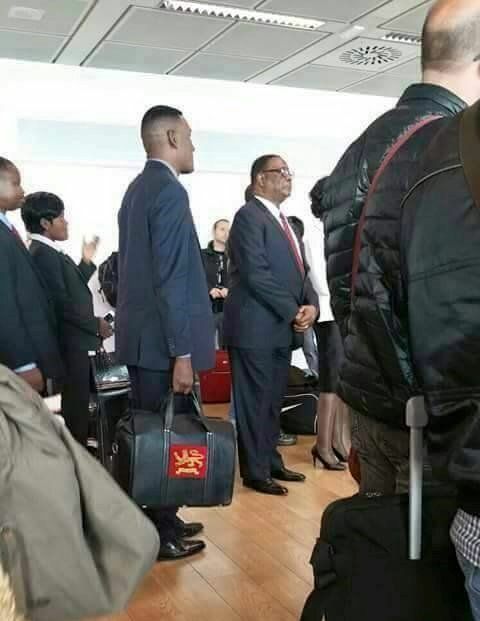 A picture is circulating on the Malawian social media showing President of the poorest nation in the world Peter Mutharika queueing at an airport on his way to the Commonwealth Summit in Malta. Surprisingly some citizens of his poor nation are not happy with their President flying in a Commercial airline wishing he had chartered a Private jet that would cost the nation a fortune. The Malawi leader left his country on another Commercial airline flight Malawian airlines. It is said that from Lilongwe, Mutharika connected to South Africa. In South Africa he took a long flight to Rome and waited for four hours at an airport in Rome before connecting to Malta. A few weeks ago, Mutharika was adamant when he was cornered over his decision to take a Private jet to the UN summit in USA. In a Press briefing that Mutharika held after a return from New York for the UNGA, an angry Mutharika told off a reporter who was pressing him on whether he will keep chartering a jet. “I don’t care whether you don’t like me as a person but the office of the President deserves some respect,” an angry Malawi leader said to the journalists justifying why he had to keep chartering Private jets. “Do you want your President to be waiting at the airport for 10 hours?” an angry Mutharika said while banging on his table. Mutharika then said that he had been rich throughout his life and did not see anything wrong with leading a comfortable life. However despite his rants, Mutharika has bowed to public pressure and on his latest trip he took Commercial flights to Malta in a move that has divided public opinion. “This is putting national security at risk,” a ruling DPP sympathiser posted on Facebook together with a photo of the President on a queue at an airport in what has been said to be Rome. “Is this the reason why we sold the jet?” queried another person referring to the jet that was sold by former President Joyce Banda and no one knows where the proceeds went to. “Mutharika is not the first President to fly commercial, Presidents always fly commercial,” posted writer Stanley Kenani referring to a photo that purportedly shows Kenyan President Uhuru Kenyatta checking in for a Commercial flight. A fortnight ago, President Mutharika had to delegate a trip to the India-Africa summit in India on what he said were cost-cutting measures. don’t think of comparing Kenya with Malawi…Kenya is a rich country!!! Amalawi mulibe pabwino akakwela zodula kumunena zawamba kumunena mukuonangat afa ngat abro ake??? A Malawi are the most daft people. Kumangolemba zinthu zopanda substance basi. Why not just watch in silence if you have aorta of facts. Koma abale. Paja ankat nd bilionare osagula yake bwnj azikwera angofunabe misokho yathu basi buluzi ameneyi. A Malawi, let’s change our mindset. Zochitisatu manyazi izi. Mudzayimeleko inuyo ndi mfundo zanu zo pusazi mudzaone ngati adzakuvoteleni, amai anu anathawilanji, aliko akuchita uhule ndi bz imene akupanga, ndi khalamba zothamanga usiku, amunao pano atha chaka osagona ndi nkazi, ngati osakwatila akazi ali m,maroom ku us. Sizingatiphulire kanthu zimezo.It’s just a matter of deceiving us ndalama akuba.Madonors Anasiya Kalekale Kuthandiza Koma Zinthu Zimayendako Bwino.Even Thawi Yomwe Ndalama Zimabedwa Amalawi Ambiri Samadziwa Chifukwa Zinthu Zinaliko Bwino.Mukufuna Mutiwuze Kuti Amalawi Adasiya Kukhoma Misonkho? Kapena Ndalamazo Bwezi Zikanagwirabe Ntchito Paka Lero? Zopusa. It’s silly 4 us allow our president fly commercial. We r not trtng his office wth due respect. Let’s change our mindset. Amene akumudaula ndi anthu amene alibe chochita, alesi komanso mbava, chifukwa anyamata awa samanyengelela mbava, koma kwa othamanga thamanga tili pambuyo panu moti 2019 kuwina kosayamba, wina asayese kuti amayi ake adzawina, ngakhale atagona ndi wina aliyense . Nthawi zonse mphawi wake ndi mmwano. Achite hire walakwitsa. Ayende zachisawawazi alakwitsa. Kuoneka anzeru koma kuyendetsa banja kukuvutani. Koma nkhani zadziko kuoneka anzeru. Bizinesi yabonya ikumakuvutani. Olo ataleka kukwela olo akwele iwe ndi ine kwanthu kukanda basi, olo ataleka kulamula, olo atapitiliza adzakhala olenela basi, tiyeni tilinbikile kugulitsa bonya amene anabweletsa amai mwina mulungu angatupatse walelo. Poor performance by foreign affairs/OPC. Peter ndi VIP. Why not wait in VIP Lounge and get papers processed and board the plane as VIP/ President??? This is not adding up. Advance planning inavuta apa. Keep up saving bwana, there are multiple poverty problems back home. Som SUPORTS r completely MISPLACED.Use ur brain whn comentng not ur eyes or ears.Thus u say NOSENSE.Hw much do u get fr suportng MEDIOCRITY??? I Totally Agree With U Muluzi Nde Munthu Iyipa Amene Anononga Zinthu Mu Dziko Lino In Terms Of ,security,eduaction,religion,dressing,economy And Politics Komanso Corruption Inabwera Ndi Bakili, “anyamata A Pa Town Lyoolyoooo! simuluzi koma kusauka basi du u want to kuti muluzi anaba money if so wer did he go with the money he invested the cash in atupele properties the companies wich is employin malawians so no stress about muluzi leave him alone. President of the poorest country in the world waiting in line? Nothing to be ashamed of! Guys nde chimodzimodzi ndikuboda Marcopolo!! Even in zimbabwe thy hav jet,although ppl r suffering,de problem with us r we take wrong advise frm western not knowing dat these ppl doesnt lov us.how can some1 control some1,s family dats stupid, that is wy we,re against de leaders who dont tolarete foreigh policies, we all know dat.at end u say munthu wosamva.plz leav malawi alone wy cant u go and cocentrate ur problems than using us. OK – then starve! We donors can certainly ‘leav malawi alone (sic)’ ….but you will just complain when we do so. Willard that man is rich he can buy 5 jets aday politicians are thieves. After ten years he will steal and leave Malawi bankrupt. They’ll always fool you. You are poor but a recist. Man amalawi lekani kumaongolela presdent, poyamba amakgala wabwino, mumayamba kumunena kuti mbava ndipamene sanayambe kubako, kumapeto amati lekani ndibe zeni zeni akamandinena zikhale zili zoona. Amalawi ambili ulesi aise, othananga thamanga ndi ochepa, ndichifukwa malawi adzasaukila saukilabe. Yambanipo mlekeni pete agwire imene munamulemba. We malwians we,re not poor lik de way u think,1thing u shud no is we,re not dependability,its de other ppl want us to be poor by means of using us,hence we ,re hard worker. Stop singing old song dat we are poor,cuz we,re not waiting anything free frm gv,than support only .u can go to Guine Bissau and see how poorness thy ,re and u gonna see de different dat beter mlw we r civilized stupid admn. Atakupatsa iwe sungabe, kodi inu mumuphunzitse presdnti kulamulila munalamulapo chani, olo nkazi wanu mumamulephela kumulamula, namakusiyani kukanyengesa kuli kumulephela kumeneko ndiye mukamuuze presdnti chochita, mukulephela kuyendetsa ka biznez kanu kakang’ono, mpaka lelo mulu rent, ndiye mudziyimba beru muli pa keliyala, Kaya agura bagule ndegeyo. Major 1 original Shepherd Bushiri anakana kademon ka umphawi pa malawi’! ministry pano ili ndi ndege ziwiri majet. Ndi apempha daddy in the lord Jesus to borrow you one iye! Power! Amalawi sanje mpaka mumuyendetsa pakabaza HE KKK. Inu opusa kwabasi, mukuonangati boma lidzikudyetsani inu mudzingobala wana basi, kulanulilako nonse mufuna kuti mulanule nao. Alesi ndianthu olongolola kwambili, akapanda kupita mafuta muwatenga kwani, kumalakhula ngati m,zukwa bwanji, kapena mwabwela dzulo, mwina ndiwe mwana chifuka amene sanaine maulamulilo ena apitawa ali ndi nzeru za chikhanda, mwina ndi kusayenda, kwanuko. Anthu openga munakhala bwanji? Ksaukatu kwa Malawi sichifukwa cha jet. Koma mumufunse muluzi kuti, ndichifukwa chani economy yathu inalowa pansi. Then muyambe Ku ndongonda. From 1994 boma linagwetsa mphavu ya kwacha kamba ka dyela. Pofuna kuti ma donors akapeleka iwo azilandila zochuluka. Anaiwala za anthu osauka. Vuto lija lelo lakula mukuti jet. Asakusokonezeni mitu abale. Botswana anthu ake ndi osauka koma boma ndi lolemela ndalama yawo ndi yamphanvu. Sanakonde dollar poopa ngati izi. When the going gets tough, you have no option Mr. APM. All must tighten the belt until the waist gets thinner like a wasp. I know how it feels to spend 12hrs in the air space then four hrs at the airport, tired of reading papers, eee but since we want to serve a little its ok.
Amati atani ? Amalawi amuphwesa amati apange zijazamwano, don’t underrate Malawians , Peter will be brought to the size they want. He thought that Malawians are sleepy he is now dancing to their tunes in their public interest . He should have asked those who were in power before him and they were going to give him the behaviors of Malawians.